Anvos, noted movie and television prop replica maker, is releasing a movie-accurate replica of Luke Skywalker’s ‘Red Five’ Rebel Pilot Helmet from the Battle of Yavin AKA the destruction of the Death Star. 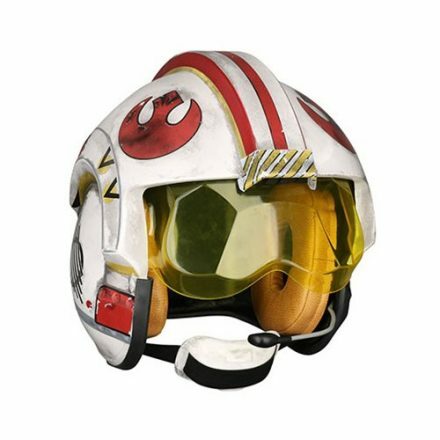 Created from digital scans, as well as measurements of the original prop and references from screen-used production assets, this helmet features an exterior made of ABS plastic with a fully-lined interior, including comlink boom and earcup cushions. This helmet is adjustable, however only up to a US 8 hat size. As is usually the case with products like these, it’s available as for pre-order, and is estimated to be available on January 2019. This entry was posted on Tuesday, June 5th, 2018 at 01:20	and is filed under Movies, Toys. You can follow any responses to this entry through the RSS 2.0 feed. Both comments and pings are currently closed.